The ignorant child has actually doubled down on abolishing ICE. A gruesome video of a gang-related murder on the New York City subway has gone viral. A suspected MS-13 gang member shot a member of a rival gang in the face numerous times in a daytime shooting on Sunday. The suspected gang member has since been arrested. 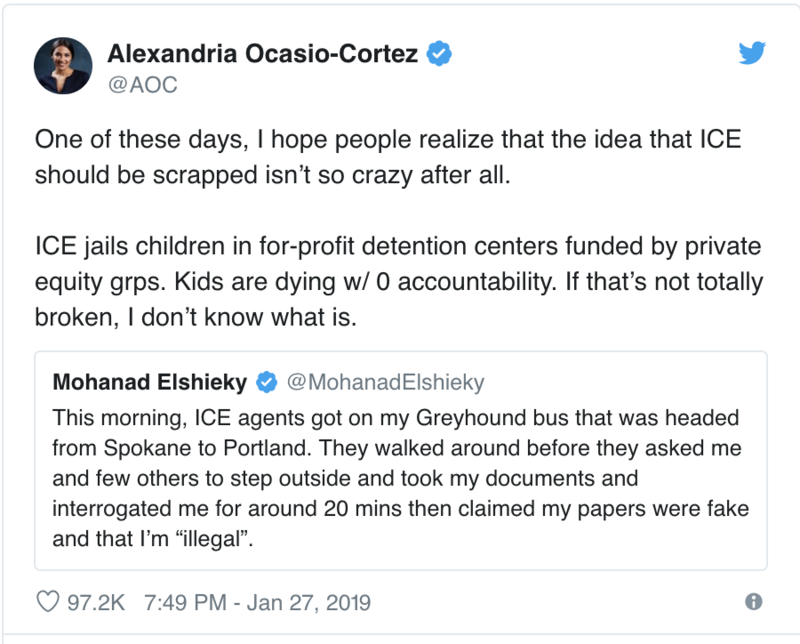 Notably, Ocasio-Cortez has been an outspoken advocate for the abolition of Immigration and Customs Enforcement (ICE). MS-13 is a murderous gang comprised of mainly immigrants from El Salvador, and the suspect in Sunday’s murder was previously arrested by ICE. Ramiro Gutierrez, 26, “was reportedly free on $2,500 bail at the time after being busted on attempted murder and other charges in December,” reported Fox News. Gutierrez was arrested by authorities on Monday and charged on Tuesday with second-degree murder, gang assault, and criminal possession of a weapon. The victim has been identified as Abel Mosso, a 20-year-old reported member of the 18th Street Gang, a rival gang of MS-13…..
As noted by Ryan Girdusky, a New York City native and Washington Examiner contributor, ICE arrested 107 illegal aliens with criminal records in Queens, NY, from January 14-18 — just weeks before Sunday’s subway murder. That’s fine with me. No ICE in her district.